A team of architects specialised in the restoration of historic buildings is responsible for restoring the Noble Floor at Casa Batlló. This team, with over 20 years of experience in the sector, is formed by Xavier Villanueva (architect), Ignasi Villanueva (civil engineer) and Joan Olona and Mireia Bosch (technical architects). In this interview Joan explains the most recent and surprising discovery made at the House. What is the background to this discovery? How did you come about it?In July 2017 several small samples were extracted to rate the quality and colour scheme of the different rooms of an apartment on the third floor, which was originally rented out. In the laboratory, the microphotographs and X-ray diffractions revealed mortar based stucco composed of lime of an outstanding quality, which amazed the restoration team. This discovery led us to pose a significant question. If one of the rental apartments had such quality coating on the walls and ceilings, could the Batlló’s house surprise us even more? What were the next steps?A second round of samples was taken from strategic spots on the Noble Floor, where the Batlló family used to live, this time broadening the tests performed to try to obtain the maximum information possible. The first stratigraphic samples taken until reaching the original coats promised astonishing results, as they revealed textures and chromatic varieties that were concealed by the paint covering them. Finally, the laboratory samples further highlighted the grandeur and quality of the coating work on the walls and ceilings of the Noble Floor. What did you discover?We discovered the original coating hidden under several coats of paint. The technique used was a lime stucco with various different shades. After the traditional 3 coat stucco, incisions were made to achieve the craquelé that is so characteristic of the Noble Floor. The incisions were subsequently refilled with lime mortar and finished with wax. The different experts who have analysed the technique consider it incredible for several different reasons. Firstly, because this technique implies working on the same square metre of wall and ceiling up to 6 times, but also because of the quality of the finish, the multi-tone distribution and the colour changes in the stucco. More surprises?Thanks to the work carried out, we were able to detect alterations linked to the use made of the spaces in the past, not only as a home, but also as the headquarters to Seguros Iberia and the Chamartin Animation Studios. I am referring to installations that were not correctly done and that needed to be corrected. Another added challenge.Yes. This restoration of the Noble Floor is a challenge for all those involved: the restorers who worked on the first phase, the stucco experts who have to replicate an impressive technique and those in charge of reproducing the wainscot. It is a historic challenge, a huge responsibility and knowledge that is well worth documenting and disseminating. 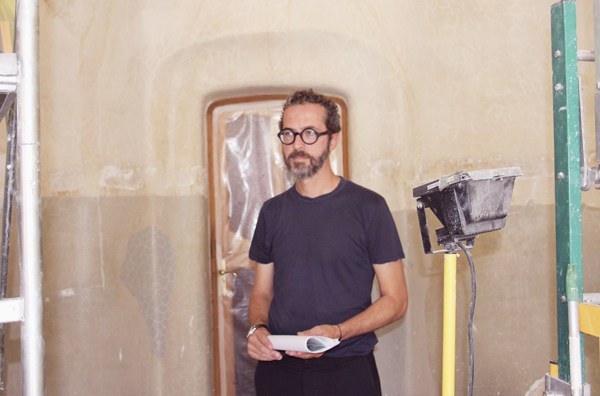 Xavier Villanueva: "Casa Batlló is continually being restored"